• Radio Bean in Burlington? Bad Girls Cafe in Johnson? The Village Cup in Jericho? Vote for your favorite Vermont coffee joint on Vermont Hum. I guess this is a good time to point out that you can also leave comments about these places on our Seven Nights Dining and Nightlife Guide. • Beauty is truth, truth beauty. Outrageouschaos does not appear to be a still unravish'd bride of quietness, but she agrees with Keats. In case you can't tell, I love this blog. • Ouch! Charity Tensel totally disses Loyal Ploof, who attempted to run for Burlington City Council as a Republican. Today Ploof has announced he's not running after all. • I didn't make the connection until yesterday that the Steve Mermelstein who blogs at #!/usr/bin/geek is the same Steve Mermelstein who owns the old Milton Bowling Center, which is about to be leased to a national retailer. • They're buried at the end of this post, but Philip Baruth links to some fascinating online projects related to governmental transperancy. • More discussion of the governor's e-state concept from tech savvy Tom Evslin of Stowe. By the way, more than 3,000 local households signed onto their neighborhood forum in our first few months of operations. If you live in Chittenden Co., then there's a neighborhood forum serving your area... join your neighbors at Front Porch Forum. 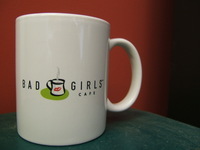 I bet you thought that nobody could come up with a worse name for a coffee shop than "Bad Girls" ... well, they did. Yep ... "The Groovin' Beans" ... the name is so bad that I won't even go in anymore. No! I always stopped at Bad Girls in Johnson! I loved that place! Groovin' Beans is an awful name. I'll still go there, though, next time I'm in town. Yea, I was just kidding when I said that I won't go there anymore. It's still a really nice place to get a hot drink, a sandwich. It's also a great place to go to catch up on the Johnson gossip. "I would have gladly welcomed Loyal Ploof, who volunteered on one of my City Council campaigns. There is common ground there, with Loyal. I do not dispute that. My problem is with how the situation transpired." Anyway, thanks for the link. I sure don't mind the traffic. Charity, I was referring to this: As John Briggs in the Free Press reported this morning, my thoughts were that it was like watching a car accident - "really shocking to have that happen in front of you. You want to stop it, but you can't. " My apologies for not also drawing attention to the fact that you tried to emphasize your common ground. I guess that line is pretty harsh. The comment was made about how easy it was for someone, who is clearly not a Republican, or at least never has been, to just come in and become the party's candidate. It was very surreal to watch. I guess there is no way to sugar-coat my comments, though. They were not favorable.